Temple Lodging in Japan "Kongozanmai-in"
This is a temple dedicated by Masako Hojo to console the spirit of Minamoto-no-Sanetomo (the third shogunate of Kamakura). 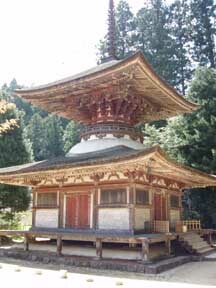 Tahoto tower, a national treasure, is one of the three treasure towers in Japan. 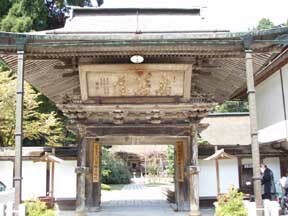 Much old, historical architecture, including Kyozo (an important cultural asset), Shisha-Myojin-sha and Kyaku-den can be found here. 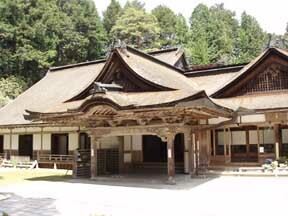 When it comes to architecture, it is the best among the many shukubo lodgings on Mount Koya. As it is a little away from the town, you have to walk a little, but the environment is quieter and you can enjoy the serene atmosphere. The 400 year old gigantic laurel is worthy of seeing at least once (best seen in mid and late May). It was during the Bon holidays in August and we stayed at a building connected to the hall through an underground path. 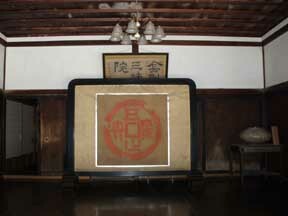 The room was equipped with a TV set, air conditioning and a safe. 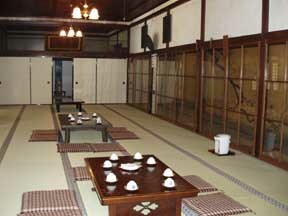 Also, a yukata robe, a towel and a toothbrush were provided in the room. I was happy to find a complimentary dumpling called a Mirokuishi in the room. The bath was open until 9:00 at night. There were bath towels as well. However, water did not come out from the shower. Hairdryers were provided at the bath and at the washbasins. The morning service starts from 6:30 at the main hall. While the priest chanted sutra, we offered incense. After that, a piece of paper describing the poetry of a song was given to us and a song called "Shukai no Yorokobi" (Joy of gathering), which I think is a theme song of Mount Koya, was played. Following this, we listened to the religious lecture given by a priest and toured the main hall. It took about an hour in total. They served shojin vegetarian food and it was very delicious. The dinner was large in volume, so ladies may not be able to finish it all. I especially liked the bouncy sesame tofu. Both dinner and breakfast were served in the room. They also took care of the futon mattress.